Hong Kong Dolphin Conservation Society offers regular dolphin research trips to HKDCS members (including Facebook members) to observe the Chinese white dolphins in their natural habitat, as well as to learn more about local research activities. DOLPHIN TRIPS: These trips are usually held in odd-numbered months, and trip details will be announced on HKDCS Facebook Page as well as via email or eNewsletters to all subscribers. Or you can check the calendar of events to find out when the next trip will be conducted. OTHER SERVICES: HKDCS provides educational dolphin-watching boat charter services for schools and organisations depending on the availability of HKDCS researchers. 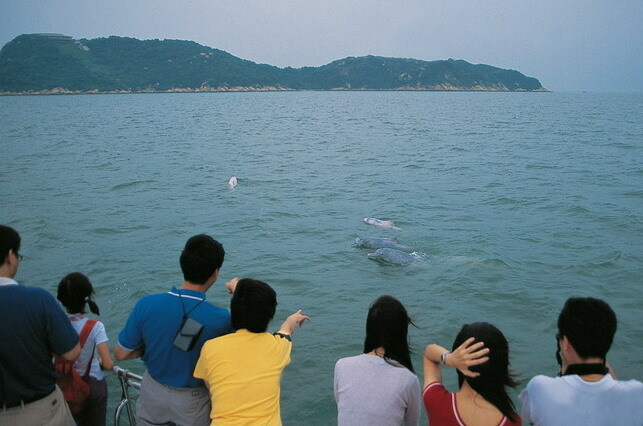 The dolphin trip will be conducted in waters around Lantau island in search of local dolphins. HKDCS researchers will be on board to give in-depth educational narratives about cetaceans and their surrounding environment. For more details, interested parties should contact HKDCS at 2866-2652 or email us at info@hkdcs.org to check our availability to lead these educational trips.